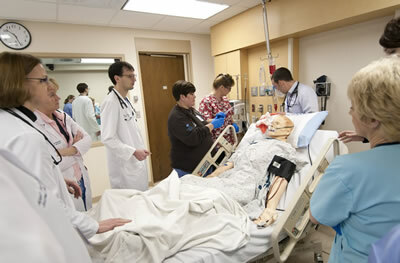 In early 2009, the residency's Abbott Northwestern Center for Clinical Simulation was completed. The new center was founded by the internal medicine residency program, and provides high-fidelity simulation in replica ER and ICU rooms for multi-disciplinary training of code situations, emergency management, and high-risk/low-frequency scenarios. The center's AV system captures scenarios, and facilitates video debriefing following the simulation sessions. Laerdal's SimMan3G is the simulation "centerpiece". 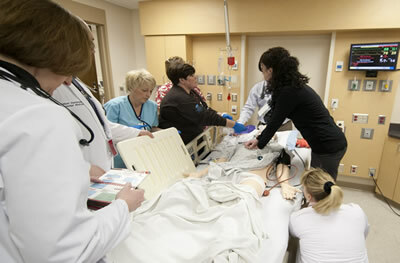 Residents are the core training group utilizing the simulation center, and the center is lead by the internal medicine residency faculty with collaboration from faculty in the departments of critical care, emergency medicine and nursing education. It allows for multi-disciplinary training and interaction between different members of the healthcare team including nursing, pharmacy, physicians, anesthesia, etc., a skill that is critical to an efficient and safe healthcare team. Every other Friday morning, as part of their scheduled day, the residents participate in full Dr. Blue (code/resuscitation) sessions with nursing, code pharmacists, and respiratory therapy/anesthesia. The simulation center plays a major role in procedural skill training and procedure simulation during the resident's Procedures & Ultrasound Rotation as discussed in a previous section of this site. In 2000, the ANW residency program began building an extensive collection of our own clinical tools. These tools include a large number of unique calculators and clinical decision support aids that make up our web-based toolset. The toolset is now accessed via a variety of interfaces including smartphones, wireless mobile browsers, hospital computers, etc. The goal of these tools are not to duplicate tools that are available in other locations on the web, but rather to provide individual patient care decision support based on evidence-based guidelines. The Abbott Northwestern Internal Medicine Residency Program continues to innovate in educational technology for our residents and faculty. The residency program transitioned away from residents and faculty carrying multiple electronic devices (pagers, iPAQs, cell phones) with the introduction of the ANW SmartPhone Program in 2008. The residency program supplements the cost of an iPhone or other SmartPhone for its residents and faculty. This phone acts as the physician's pager, cell phone, and an "always-connected" interface to the ANW web-based toolset, as well as multiple other online references (UpToDate, DiagnosisPro, Epocrates) via WiFi signal in the hospital and cellular 3G signal outside of the hospital. It also provides the physician's interface to other clinical tools such as our ultrasound tracking system. The phone works as a text pager receiving all incoming pages from nurses in text format. It also functions as a physician-to-physician communication device via text messaging software. The paging interface for nursing staff only shows physican names, rather than phone numbers and iPhone functions allow for the ability to easily separate work from home. This program facilitates the use of a single "convergence device" in the iPhone or other smartphone to meet all of your clinical and personal needs in and out of the hospital. The Allina Health System has one of the most extensive and advanced computerized medical record systems in the country (Epic Systems, Madison, WI). All 11 hospitals and over 60 clinics use the same medical record which includes all patient information, clinical documentation, and orders. This system began implementation in 2004 and is now fully deployed and mature. Our computerized medical record was the recipient of the Davies Award from the Healthcare Information and Management Systems Society signifying "one of the most fully integrated, comprehensive electronic medical record systems in the nation." The Twin Cities is a unique metro area in that most of the other hospitals are also on the same computerized medical record as the Allina Health System making transferring patient information between hospitals much easier. Many aspects of patient care as well as physician efficiency have improved with the system. Residents have remote access to the medical record and radiology system from any location. Large digital displays are used during attending rounds and most of the other regular resident conferences to interact with our electronic medical record, digital radiology system, ultrasound image server, and online resources including our physical diagnosis and media database. This allows for multimedia conferences and adds the ability to use our audience feedback system that is integrated with our smartphones. This allows for a dynamic interaction between the presenter and residents that improves learning.